Your Trusted Malaysia Motor Vehicle Insurance Services Provider. No Matter how good your own driving skills are, owning a car can be an expensive and risky business. That's why it pays to cover your vehicle against accident or theft. ACPG Motor Insurance offers you a thorough and comprehensive approach to motoring wherever you go. If your vehicle is already covered by another insurance company or agency, switching over to ACPG is easy. You may transfer your NCD (No-Claim-Discount) over in full. This policy provides the widest coverage. Provides you cover as in Third Party, Fire and Theft Cover plus physical damage to your vehicle due to accidental collision or overturning. * Loss/damage arising from an act of nature e.g. flood, landslide and landslip. Covers the breakage of glass in windscreens, front, rear and side windows. The damaged windscreen will be replaced and your NCD (No-Claim-Discount) will not be affected. Flood, Storm, Landslide, Landslip or Subsidence Cover and Damage by falling Tree. Covers the vehicle against damage caused by the above perils. Covers the vehicle against damaged caused by strike, riot and civil commotion. This extra coverage waives the RM 400.00 Excess. Cover the legal liability of passengers for acts of negligence. Cover protects the Insured against legal liability to the passenger in event of a claim. (Premium Charged - 25% of Third party premium. Basic premium up to 5 persons only. You will be covered for first 10 days while your car in the workshop. You will have a choice to spray paint the whole car even thought the own damage repair only allow for the spray painting of the damaged part of the car. Your contribution towards the cost of new parts replacement will be borne by insurer. * Nationwide network of panel workshop. * 6 months warranty on repair by insurer panel workshops. of the contract and at each renewal. You must ensure your car is adequately insured as it will affect the amount you can claim in the event of loss / damage. For new car, the sum insured is normally the purchase price. For other cars, the sum insured should be based on the market value of the vehicle when you buy the policy. Under-insurance: if sum insured is less than the market value, you are deemed as self-insuring the difference. In the event of a loss, you will only be partially compensated. Over-insurance: if sum insured is higher than the market value, maximum compensation you will receive is the market value of the vehicle. You cannot profit from a claim (principle of indemnity). It is important to insure your car at the appropriate market value to avoid under-insurance or over-insurance. With effect from 1 August 2011, your insurance company (and also takaful operator) or the agent must advise you on the present market value of your car before you buy or renew your motor cover. Advice on the present market value must be based on the ISM Automobile Business Intelligence System (ISM-ABI system) or any other credible vehicle valuation database. The present market value of your car will be indicated in the renewal notice or product disclosure sheet issued to you before you buy the policy. The advice will be provided to you without additional charge. If you agree to insure at the value recommended by your insurance company, you will not receive a lower amount of compensation following a claim due to under-insurance. To ensure consistency in the market value of your car at the point of purchase and subsequent claim, your insurance company should refer to the same database to determine the market value of your car in both instances. You and your insurance company agree on the value of the car at the beginning of the contract and at each renewal. If your car is totally destroyed or stolen, your insurance company will pay the sum insured in full. Effective 1/4/2015, All Motor Insurance Policy are subject good and service tax (GST 6%). This class of insurance is governed by the motor Tariff and can only be transacted on a Cash Before Cover basis. Any liability claims from third party for property damage and /or bodily injury arising out of the use of the vehicle. Legal liability to passengers ( LLOP ) ?25% of third party basic premium for first 4 passengers. When a vehicle is transferred to a new owner, a fee of RM10.00 ( for all classes) will be charged for the transfer of the insurance policy. NCD is not transferable. All Insurance company premium is the same, as the rate is governed by Bank Negera. Thus, there is no difference if you purchase your insurance from ACPG Principal Insurer or your existing company. The insurance premium rate will be the same. The only possible difference is excess or loading which is subjected to many conditions and at the discretion of the Insurance company to impose. Your NCD entitlement is usually mentioned in your renewal notice from your existing insurer. It is important that you do not under-insured your car. Find out your car present value based on your car make/model via ACPG Principal Insurer Agreed Value. 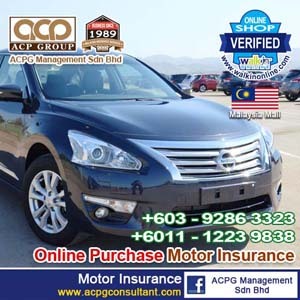 4) May I know the Policy coverage and benefits from ACPG Principal Insurer Motor Comprehensive Cover? As your motor car insurance will be under-written by Allianz, we encourage you to read about their Product Disclosure Sheet to better understand here. 5) What benefits do I get by renewing with ACPG Principal Insurer General Insurance? If you choose to renew with ACPG Principal Insurer General Insurance, you will enjoy 24 hours ACPG Principal Insurer Auto Assist (Road Assistance Program), free expiry reminder service, immediate online cover note issuance and fast claim service. Yes, ACPG Principal Insurer Insurance covers private and company registered cars, Permit A or Permit C Lorry or commercial car. 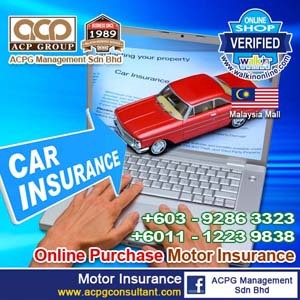 Yes, ACPG Principal Insurer have provide emergency roadside assistance. It is 24 hours a day, 365 days that can be reached at here. 9) What is a "NO CLAIM DISCOUNT? (NCD) entitlement? If any claim is made on your motor insurance policy during the period of cover, your NCD will be forfeited and revert to 0%. You will have to start to accumulate your discount in a new cycle. However, this excludes no-fault Own Damage claim and windscreen claim, provided if an additional cover for windscreen is purchased. 12) Can I transfer my company registered car NCD to my personal car? You are advised to cover your car based on ACPG Principal Insurer agreed value at the time of renewal. In the event if your car is under-insured (insured for a sum less than it ACPG Principal Insurer agreed value) at the time of any loss of damage, the Average Clause in the policy will apply when the insurance company settles your car insurance claims. You shall bear the difference and the rateable proportion of the loss when the market value of your car at the time of loss exceeds the insured value. For example, if your car is under-insured by 20% than its market value, the insurance company will compensate you 20% less for each claim. If your car is over-insured (insured for a sum more than its ACPG Principal Insurer agreed value) at the time of any loss of damage, the insurance company will settle your claims enough to cover the loss incurred up to the market value of your car. If you over-insured your vehicle, you would have paid higher but unnecessary premiums. After an incident that could lead to a claim you should notify ACPG and ACPG Principal Insurer immediately, if you required towing service to send your car to ACPG Principal Insurer approved panel workshop only. Lodge Police Report within 24 hours and send your insured vehicle to our approved panel workshop. Should you need claim advice and guidance, please contact ACPG customer service +603-92863323 or your nearest ACPG Principal Insurer branch. You may send your car to any of ACPG Principal Insurer 345 approved panel workshop nationwide. ACPG Principal Insurer approved panel workshop will undertake to arrange the repairs. For accidental damage less than RM5,000, ACPG Principal Insurer panel workshop can immediate commence repair work without adjuster assessment. If the repair cost more than RM5,000, ACPG Principal Insurer will send an adjuster to assess the damage within 48 hours and the workshop will start repair work after the adjuster assess the damage. For other types of claim, Allianz aims to settle the claim within 10 working days subject to complete documentation has been obtained. Please call ACPG customer service for more details at +603-92863323. The excess is the first amount of claim borne by insured. 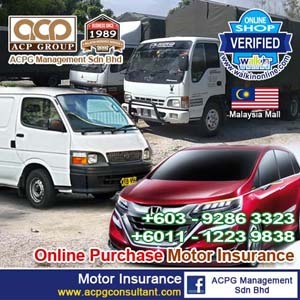 For example, insured total claim amount is RM4,000 and have an excess of RM500 on your motor insurance, ACPG Principal Insurer will settle the RM3,500 and insured will have to pay the balance of RM500 before the workshop release your vehicle. - named in the Schedule who is less than the age of 21 years and/or the holder of a provisional (L) driving license and/or the holder of a Full driving license of less than 2 years. Loading is an additional surcharge imposed on the basic premium rate to cover high risk exposure. Examples of risk factors for loading are driver age/named drivers?age, age of vehicle, claim experience, high performance/sports car. 21) Do I need to inform ACPG Principal Insurer of any changes of engine to my car? Yes, you are required to inform ACPG Principal Insurer, because change of engine may change the risk exposure and premium amount charged. Your car may well be the second most valuable asset that you own other than your house. Here are a few things that you should know when buying a motor insurance policy for your car. Who and what is covered would depend on the type of car insurance that you have purchased. Parties involved - 1st party is you; 2nd party is the insurance company; and 3rd party is the other persons in an accident. and Loss/damage arising from an act of nature e.g. flood, landslide. Please refer to your policy contract for the full list of exclusions under the policy. However, you may pay additional premiums to cover some of the above exclusions e.g. flood, landslide or your liability against claims from your passengers (a passenger who is a member of your household will not becovered). "Mr A" bought a comprehensive car insurance policy and paid additional premium to buy legal liability to passenger cover. A few months later, while "Mr A" drove his sister, "Ms B" to town, the car skidded and knocked into a tree. Both "Mr A" and "Ms B" were injured in the accident. The policy only covered the cost of repairing "Mr A" car. "Mr A" bodily injury claim was not payable because the policy does not cover death or injury to the person who bought the policy. Although "Mr A" has a legal liability to passenger cover, "Ms B" bodily injury claim was rejected because she was a member of "Mr A" household. What you should know when buying car insurance? When insuring your car, it is important that you disclose all material facts to your insurance company e.g. anyprevious accidents and modification to engines. If you fail to do so, your insurance company may refuse yourclaim or any claim made by a third party against you. In such cases, you are personally liable for those claims. Agreed Value where you and your insurance company agree on the value of the car at the beginning of the contract and at each renewal. You must ensure your car is adequately insured as it will affect the amount you can claim in the event of loss / damage. For new car, the sum insured is normally the purchase price. For other cars, the sum insured should be based on the market value of the vehicle when you buy the policy. Under-insurance: if sum insured is less than the market value, you are deemed as self-insuring the difference. In the event of a loss, you will only be partially compensated. Notify us immediately after an accident. All accidents must be notified to us irregardless of whether you intend to make a claim or otherwise. Only send your insured vehicle to our approved panel workshops. If pursuing KFK (Knock-For-Knock) Claim on your policy, kindly provide us the following: All documents mentioned in item 3 above; Third party vehicle insurance information (by way of Jabatan Pengangkutan Jalan/ Road Transport Department) search; Duly completed KFK declaration letter that you are making a Knock-For-Knock Claim for damage to your vehicle on your policy. Updated copy of insured vehicle's registration card; and Original repair receipt. Theft claim is normally settled within three months from the date of notification and upon completion of investigations. Original vehicle registration card duly signed by owner Report of police investigation. This is an additional optional coverage on top of your standard motor vehicle insurance. Please note that Daily Cash Allowance is paid to you whilst Waiver of Betterment Cost and Spray Painting of Whole Car are stated in our offer letter for the own damage claim. You may speak to your insurance broker or our authorized agent to seek clarification.